Looking for more local music events in Appleton? 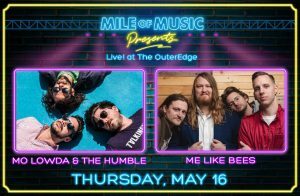 We hope you’ll join us for quality original music at an affordable price (and sometimes FREE) at the next Mile of Music Presents concert! Time: Doors at 6:30 p.m., music at 7:00 p.m. Artist: Artists for this series vary each week! Check out our latest lineup here. NOTE: This event is produced and presented by Peridot, the Fox Valley Symphony Orchestra and the Lawrence University Academy of Music Girl Choir. Mile of Music is a proud sponsor of this event! Time: Doors at 8:00 p.m., music begins at 7:00 p.m.
About: A bike ride for all ages and abilities with music at each stop! Choose from four distances: 6, 16, 32, or 50 miles. By purchasing a ticket, you voluntarily assume all risks and danger, including the risk of lost, stolen or damaged property or personal injury incidental to any event for which the ticket is issued and waive all claims against the event sponsor, the owner of the facility, the ticket producer or issuer. Admission is subject to compliance with all laws and facility rules and the ticket holder consents to reasonable examinations and searches to ensure compliance. Failure to comply with the law or facility rules may result in refusal of admission or ejection from venue. The ticket holder grants the right and license to Mile of Music/Mile of Music Presents to use his or her image, likeness, name, voice, comments or other proprietary or public rights and that of any minor accompanying the ticket holder in any online promotion, public broadcast or any future use without notification or compensation. Artists subject to change. All sales are final. No refunds or exchanges.